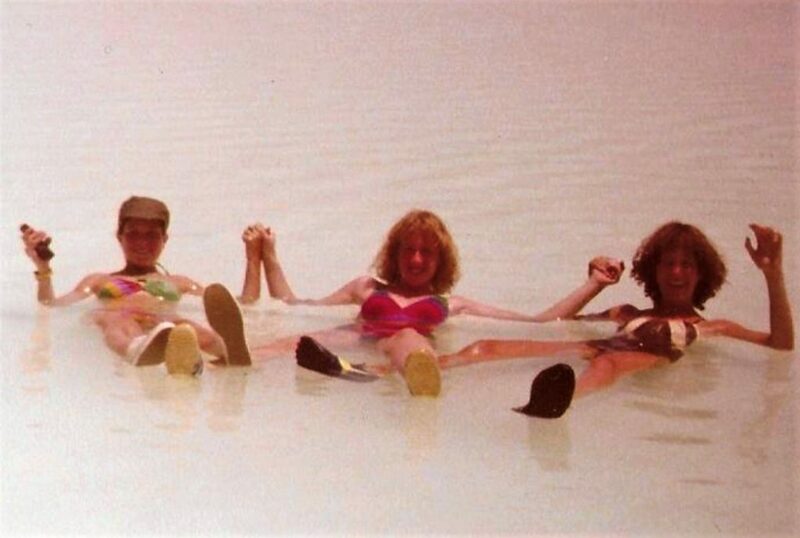 At the Dead Sea with the 1979 Jewish Federation of Greater Dallas’ Teen Tour, from left, Audrey (Essenfeld) Pincu, Anne (Leventhal) Wechsler and Jana (Pink) Kusin floated without a care. The Jews crossed the desert for 40 years, and it’s been nearly 40 since the 1979 Jewish Federation of Greater Dallas’ Teen Tour participants made their own crossings of Israel’s deserts, swam in her seas, climbed her mountains and lived amongst her people. A reunion is set for the evening of April 13 at the Clubs of Prestonwood, The Creeks, for the 65 young adults and eight staff members for who the memories remain. While Pincu and Oscherwitz look forward to seeing those with whom they can connect, memories live on of their friends Nathan Levy and Daniel Vaiser, who have since died. For six who were there, it was a summer of love: three marriages stemming from the spirit of the Sinai, the heart of the homeland. Ruth Solomon and Mark Schor met as counselors, he a Dallas representative, she a Sabra. Vicki Small knew she was going to marry Paul Friedman after spending the summer together, he telling her she had the “most beautiful brown eyes” at the tour’s orientation. Marcia Prager and her future husband, Larry Levine, met on Teen Tour, and began dating when they met again as students at the University of Texas. “I’ve been to Israel 10 times and the summer of ’79 definitely stands out. I’ve stayed in touch with a number of the participants and there are lots of wonderful memories, and crazy stories,” said Gary Grove, then a Federation employee who led that summer’s Teen Tour, now a psychiatrist in Scottsdale, Arizona. Reflecting on water shortages and medical maladies, a confluence of issues while at Gadna (an IDF program that prepares young people for service), friendships that were built, praying at the Kotel and snorkeling at Sharm El Sheikh, his own 25-pound weight loss and few hours of sleep each night, Grove’s memory bank is filled. The teens were on the road from June 25-Aug. 4, 1979, arriving in Jerusalem and never skipping a beat to Tiberias, Safed and Herzliya, to Nahariya, Haifa, the Druze village, Tel Aviv and the Sinai. From fishing villages to Eilat, from Masada and Ein Gedi, to the Knesset, Yad Vashem and much more, the travelers’ feet hit the ground running, stopping (maybe) to rest. “We got together 10 years ago, and it was like no time had passed. Staying in touch, reaching out to one another is easier with social media but there’s nothing like reconnecting in person, with hugs and toasting one another,” said Oscherwitz, a Scottsdale resident for 26 years. While many of the group has remained in touch, most participants having made DFW-area their home over the years, organizers are still trying to contact tour members Susan Aaron, Melanie Aarons, Miki Ablon, Rebecca Aronowitz, Lisa Brender, Jay Brenner, David Brothman, Roger Katz, Sarah Levin, Libbi Schwartz, Jim Shorter, Barry Sklaver, Victoria Solomon and adult tour advisors Susan Bell and Bev Cohn.